A big warm welcome to December! I still can't decide whether this year has gone by quick or slow, but it's certainly been an up and down year for me. I'm really looking forward to Winter though and now that things are starting to get better I really want to stay focused and move on from everything that went wrong this year. Whether you like spending your Winter days indoors with a hot chocolate or you like an action packed Winter, here is my list of things to see and do this Winter! 1. Ice Skating is number one on my things to do this Winter list. I love ice skating. Not that I'm very good at it at all but I just love how fun it is (minus falling over and being unable to get up). 2. Festive hot drinks. I'm lucky enough to have a Costa in town where I live as we don't have a Starbucks (sad I know). But I am absolutely loving the Costa festive drinks and cups, I recently tried the toasted marshmallow hot chocolate and it was a dream! Winter isn't the same without these festive hot drinks! 3. Buying and wrapping gifts. This year I really want to have a go at wrapping my own gifts DIY style. Pinterest have all the ideas and I think it's such a fun creative task! 4. Creating a Winter home. I love decorating my room for each season and Winter is all about the check throws and fairy lights and not to mention Christmas tree decorating. As always Pinterest is my go to place for inspiration, you can search for Christmas decoration ideas as well as DIY ideas too. 5. Festive bakes. It's all about the gingerbread men and chocolate truffles in December! There's so many Christmas recipes in books and online, especially on Pinterest where I've found some amazing Christmas cookies and cakes! 6. Go for a Winter walk. 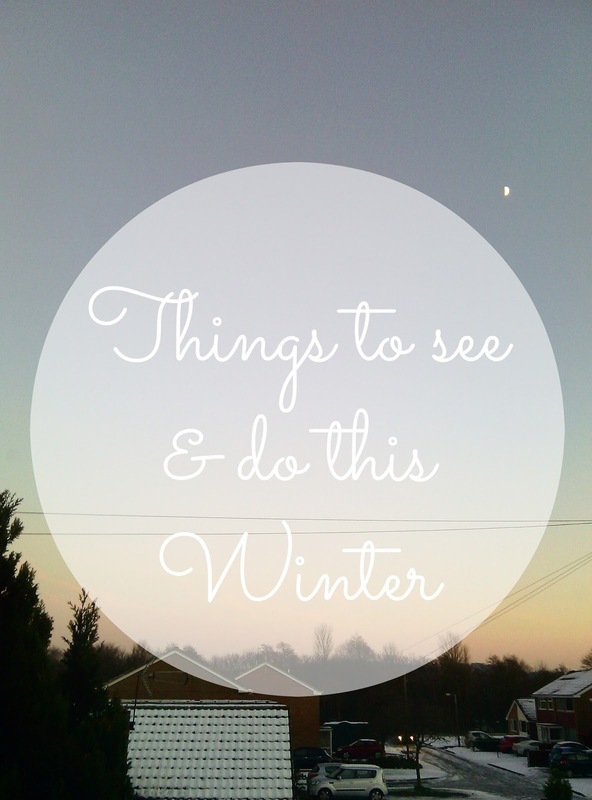 I love Winter walks, especially in the snow or when there's been a bit of a frost (not too slippery though!). Why not visit a nearby National Forest/park or visit the Peak District which will look stunning with a sheet of snow. 7. Prepare for setting new goals. We're heading towards the new year and what I always like to do is write a big list of things I want to achieve in the new year. 8. Vlogmas videos. The run up to Christmas isn't complete without Vlogmas videos! My favourite being Zoe's videos, if you haven't seen them already then do check them out over on YouTube, her videos are always great to watch! 9. Get up early to see the sun rise. A Winter morning is always best with a beautiful colourful sky with pinks, peaches and purples. 10. Visit a Christmas market. The best place to find handmade gifts, lots of decorations and not to mention plenty of hot chocolate and mice pies. Do you have anything to add to the list? Let me know in the comments! I love watching Vlogmas videos! Although I do get a little overwhelmed with how many videos that I need to watch. Me too, so many videos to watch this year!